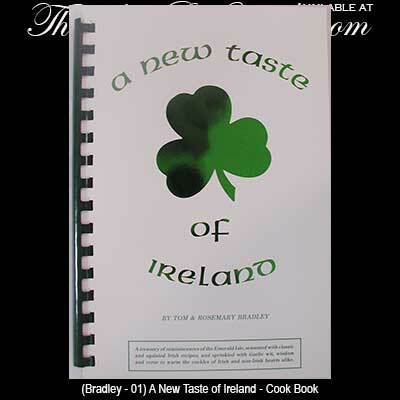 Irish Gifts - A NEW TASTE OF IRELAND Irish Cookbook. In addition to over 50 Irish recipes, there are Irish Blessings, Irish Songs, Irish Wit and Wisdom and even an Irish Roots Pull-Out Map. BY TOM & ROSEMARY BRADLEY - SOFT COVER, 76 PAGES. A miniature ring, coin, etc. are wrapped in paper and dropped into the mixture. Those receiving same have fortunes forecast--ring=marriage; button=bachelor, etc. Boil potatoes. Mash. Add boiling milk, and scalded, chopped scallions. Beat until fluffy. Toss cooked cabbage, finely chopped, gently in melted butter. Add to potatoes and parsley. Fold well. Season. Makes 6-8 servings. In a medium bowl, combine oats, flour, salt and soda. In large bowl, beat together shortening, sugars, egg, water and vanilla until creamy. Add dry ingredients, mix well and add nuts. Drop by rounded teaspoonfuls onto greased cookie sheet and bake in preheated 350 degree oven for 12 -15 minutes. Makes 5 dozen cookies. This is a traditional dish eaten by families who lived for generations in Dublin and who treat the city as their local village. Skin and slice the onions. Put them into a saucepan with the bacon and sausages. Season and add water. Lay waxed paper on top. Cover with tight lid. Simmer gently for half an hour. Always wash it down with jugs of Irish stout. Serves 6. Cream butter, sugar and flavorings until light. Add eggs, one at a time, beating well after each addition. Add sifted dry ingredients alternately with milk and coffee, beating until smooth. Pour into a 9 x 9 x 2 inch pan lined on the bottom with waxed paper. Bake in moderate oven (350 degrees) for 25 to 35 minutes. Cool and frost with Irish Coffee Frosting. Cream 1/3 cup butter. Add a dash of salt and ½ teaspoon vanilla. Gradually beat in 2 ½ cups sifted confectioners’ sugar, 2 teaspoons Irish whiskey and enough strong coffee (about 2 tablespoons) for spreading consistency. Frosts two 8” layers.